I’ve been doing some research lately on First Communion gifts for girls, as my youngest daughter is preparing to celebrate the big day this spring. I want to be sure to get her something that she can keep and cherish as a memory of the milestone. When my older daughter received her First Communion a couple of years ago, her favorite gifts seemed to be the ones that were the most personal: a custom book with her name, a personalized crucifix to hang in her room and a cross necklace from her grandmother. After searching far and wide, here are some of my top choices. Find your child’s name in each illustration. Each beautiful illustration features the child’s name. 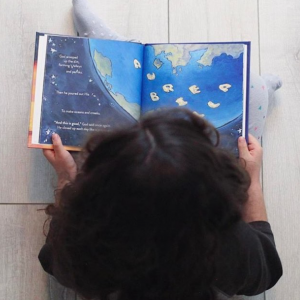 They’ll love finding the letters of their name hiding in leaves of a tree, strutting on the feathers of a peacock and shining brightly in the night sky. Even the front, back and spine of this 8.5-inch by 8.5-inch hardcover book are personalized. 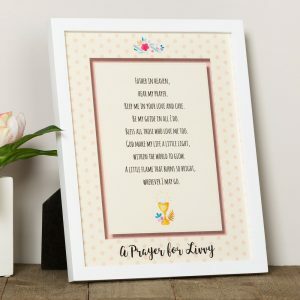 This framed art print with original watercolor accents will make a memorable first communion gift for girls. Stand the print on a dresser or hang it on the wall. The frame measures 8 inches by 10 inches and has an easel stand and wall-hanging loop. When creating a list of First Communion gifts for girls, a necklace is usually at the top. 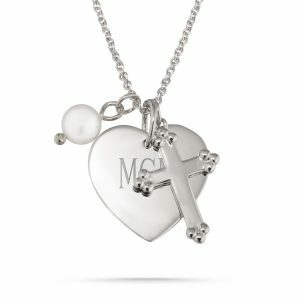 This personalized necklace features a heart charm, and two accents, one a shimmering pearl and the other a sterling cross. Engrave the center heart charm, on both sides, with your first communicant’s name, birthdate or first Communion date, monogram or a special message. A filigree heart box is also included. Made of sterling silver. Features a 16-inch chain with a 2-inch extender. 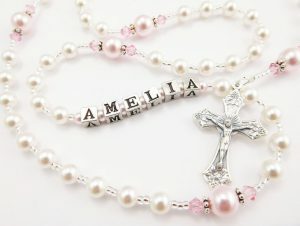 This handmade rosary includes Swarovski crystal and pearl rosary beads in white and light pink. Personalize the beads with a name. Choose between square or round letters. Includes a velour pouch and gift box. It also comes with your choice of First Communion, Baptism or other medals. 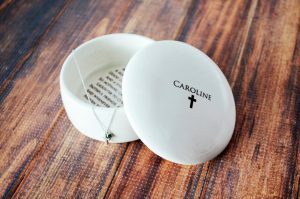 This cute round keepsake box is made of earthenware clay and can have the child’s name printed on top with a little anchor, heart, cross, olive branch or star image. In the inside of the box, include a personalized message or the “Irish Blessing.” The box measures 3.5 inches by 2.25 inches. The box also includes a gold- or silver-plated charm cross necklace on an adjustable chain. The cross can be accentuated with a birthstone to give it a special and unique touch. 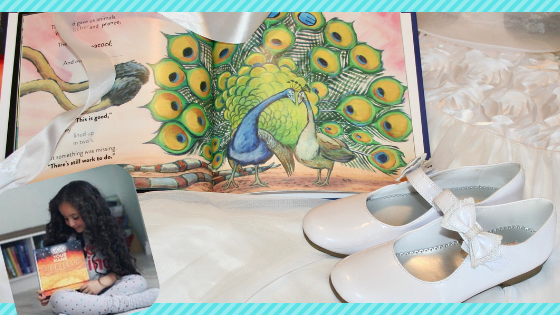 These are some of my favorite First Communion gifts for girls. Each one is beautiful, personal and custom-made. I’m going to have a hard time choosing which ones to order for my daughter. For additional personalized First Communion gift ideas for both boys and girls, click here.